To Hull and back… | Through the seasons before us..
Well the KC Stadium seemed to me like a thinned down version of Prideless Park – no wonder Adam Pearson feels at home! When I left home at 12:30, I was seriously questioning my sanity and I can confirm that on returning home at 11pm, I was convinced that I am completely insane. It was a long way to go for a 0-0 draw and sit with the Hull fans (long story), but a 6th game unbeaten is a positive. I would describe it as a competent performance – how Bullard won ‘man of the match’, I don’t know although he did have the one shot of note in the first half! I agree with you nffc – Ayala should have won it (Sky thought so too), so I guess we must have had the better of the game! So, another point and another ground. A competent team performance with Earnie working tirelessly up front on his own (Torres could learn a lot from him) and McGugan not quite hitting the dizzy heights of Tuesday evening. 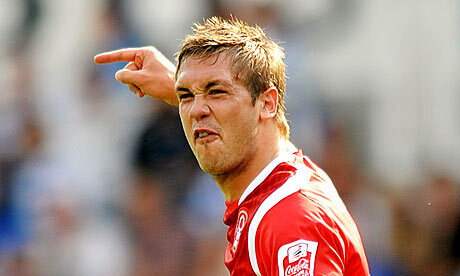 We now have a week to wait until seeing whether it really was worth MA making a fool of himself over Pratley??!! Perfectly summed up nffc. I stayed with family in the Hull area for the weekend and whilst driving back to their home on the coast, I heard the Radio Humberside phone in. It made interesting listening. Firstly, Nigel Pearson thought we “just” shaded the second half, then one fan said we put two men on Bullard to nullify his threat in the second half when we clearly nullified Hull as a whole by retaining possession and not giving them a sniff after the break (except for the last few minutes) and, finally, one fan suggested we were long ball merchants! The mind boggles! Ah, we’re all biased in our own way I’m sure. At half time I was pretty dissatisfied, it wasn’t ’til I thought about how little Campy had to do aside from some corners to claim and Bullard’s early effort that I realised how little direct threat they posed us over 90 minutes. Just a quicky here as a native of Beverley near Hull, but through family ties a Forest fan. Hull used to be in Humberside until they abolished it (http://en.wikipedia.org/wiki/Humberside) and is now known as the East Riding of Yorkshire. It was quite an issue at the time it was abolished. You have to remember too that the east riding is also within the wider county of Yorkshire which invokes fierce patriotism from almost all who are born there! I don’t feel quite so bad now then! It seems odd that people born within something they knew as Humberside have adopted the Yorkshire mantle so readily though! Good point at a tough place to go. McGugan was a bit lost in the first half and I thought “oh no, here we go again…!” but Billy seemed to drop him a tad deeper in the second half and give him a freer role and he looked tons better and certainly had more influence on the game. We looked workmanlike and strong and I never thought we looked like conceding. It bodes well if we can maintain that. I do think, VERY VERY soon, we are going to tonk someone. The Blades a week on Tuesday?? Heres hoping!!!! We were solid in the second half closed them down and worked the ball the forest way I was very pleased with how we played. Chambers miss was a sitter we should have done them.